The all new Stanton SCS.4DJ Controller is well on the way to a store near you. Stanton has managed to be unique amongst a plethora of media controllers out there by allowing the DJ to use the SCS.4DJ without a computer! The software is pre-loaded so all one has to do is add music and start rockin! 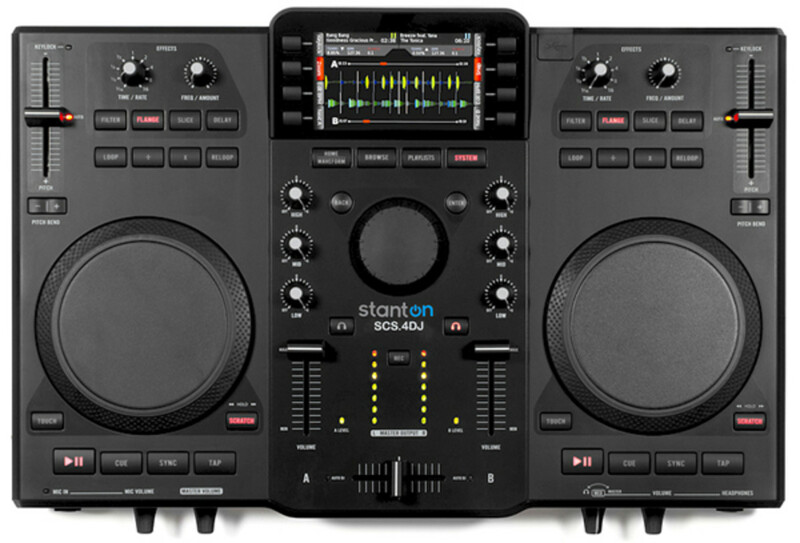 The Stanton SCS.4DJ Digital DJ Mixstation is the first true all-in-one DJ Console that combines a DJ controller with internal software, on board computer and an on-board LCD screen that can be used for file navigation, waveform display, software setup, and video playback. 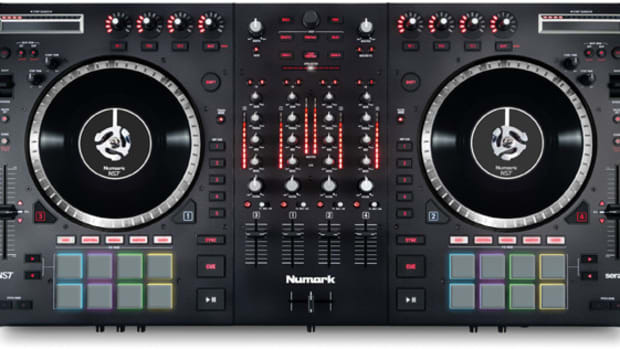 All the user has to do is add music files via USB in order to start DJing with the SCS.4DJ. The SCS.4DJ is an excellent all-around 2-deck/2-channel digital mixing solution that contains all the basic features that DJ’s need to mix, scratch, and play as they wish. The Stanton SCS.4DJ has some high-resolution jog wheels and nice faders as well. The SCS.4DJ can also be used as a full fledged MIDI controller for any popular DJ software out on the market today. I tested the system in MIDI mode with Traktor and it worked rather well, but the jog wheels felt best with the internal system. The user must simply run a USB cable from the SCS.4DJ to a computer and the buttons, faders, jog wheels and knobs can be set within the MIDI mapping of the software of your choice. The entire unit is very compact and lightweight, allowing DJ’s to slip the SCS.4DJ into almost any backpack to take the mix with them on the go. 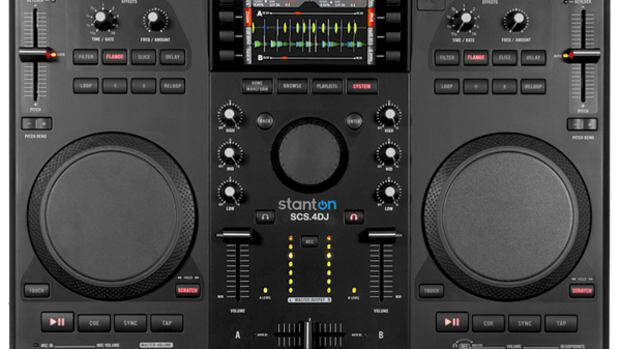 On the downside, the Stanton SCS.4DJ Digital DJ Mixstation cannot be used as a standalone mixer for additional decks since there are no additional line/channel inputs available. Another gripe I had with the unit was the lack of Hot Cues. In this day and age, everyone is using Hot Cues like they are going out of style, but the SCS.4DJ only has one Cue point per track at a time. These Cue points can only be set after a track has come to a complete stop. (Hot Cues are now added in the new 3.0 Firmware update...Please see the review update below for more information). There are also no Gain controls on the SCS.4DJ. There is an internal Auto-Gain function inside the unit’s software, but it doesn’t work as well as a Gain knob would as I’ve run into a few instances where the levels were not even. This error did not happen often, but it is worth noting. I also wish there was a way to combine the effects for more flexibility, but the four pre-set effects for each deck must be used individually. The final gripe with the unit is that it is made up of almost all-plastic. This actually saves a lot on weight, but also calls the durability of the unit into question. I recommend the Stanton SCS.4DJ to DJ’s of all flavors. 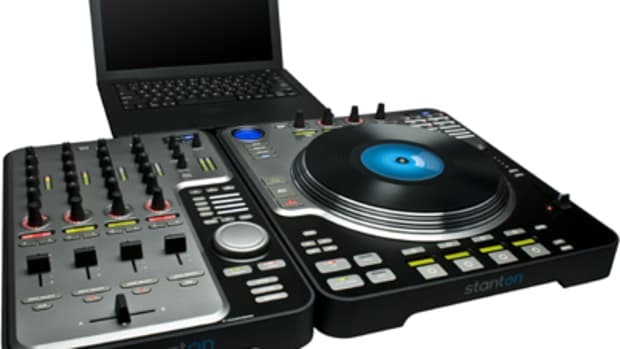 The Stanton SCS.4DJ is perfect for those who don’t want to purchase a separate computer, software interface, and controller all at once just to start spinning. I also recommend the Stanton SCS4.DJ to mobile or traveling DJ’s who don’t want to lug around their $1000 laptop, heavy DJ components, and DVS interface/software every time they need to DJ in another location. Some of the new capabilities include: • BeatGrid editing - The ability to edit a track’s beatgrid in real-time, with both “Tap Tempo” and "Dial-In-BPM" functionality, for better Sync • Three Hot cues per deck – Quick access buttons on the home/waveform screens allows users to add and delete hot cues on the fly. Hot cues are saved even when the unit is powered on and off. • Optimized system management – Switching screens is now much faster. Navigating large libraries/playlists is more responsive and precise. Performance gains are seen throughout the system. • Loop memory - User-created loops are remembered through power cycles, allowing for more powerful set-preparation. • Broader device support for smart phones, MP3 players and tablet computers. Some of the improvements include: • Headphone gain boost now selectable via a menu item. • Improved recording to USB media. • When a deck is paused, scratch functionality is automatically enabled to provide fine seeking and setting of cue points. In light of the new developments a few of the shortcomings are now satisfied and the list of Pro&apos;s and Con&apos;s will now reflect these findings. The first gripe that is now being removed is the lack of Hot Cues. With the new update Hotcues can be stored and remembered for each deck on the fly. The next gripe that is being covered is the long times to analyze tracks. Tracks are now analyzed a lot faster than before and it is no longer a real issue when using the system. Users can also analyze tracks using the computer which will make the process even faster yet. So Stanton was paying attention to the users needs and came out with an update that truly makes the unit better than ever. The first true all-in-one Digital DJ Mixstation is now available to everyone Worldwide! We reviewed the Stanton SCS.4DJ mixstation about two months ago and since then, they have been seen everywhere making an impact on the DJ world. 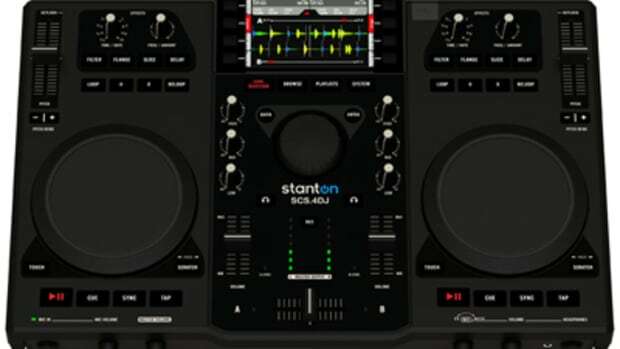 The Stanton SCS.4DJ has an on-board computer, DJ software, and LCD screen in one little package so that DJ's have everything they need to start mixing and scratching. Check out our full video review and press release inside.